ChemHat, a "must read" for CWA occupational safety and health activists and leaders, is a joint production of the Blue-Green Alliance, CWA, and the United Steelworkers. 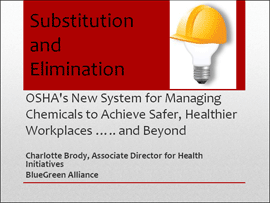 This excellent presentation demystifies technical information regarding chemical occupational and environmental hazards as well as the need to move towards the use of safer, alternative products. Developing an ongoing comprehensive workplace safety and health program. Conducting and sponsoring survey and scientific research specific to the workplace safety and health hazards encountered by the Union’s members. These activities are achieved through the development and use of a coordinated approach within CWA involving headquarters personnel as well as national, district, and local officers, leaders, and occupational safety and health activists.